Ai is little bit weird, so I must destroy gates. You can use this glitch to win this map. If you are not coward, place units to enemy way, but not to much or you will lose. In one moment it looks like AI is stuck, but do not worry, they are only preparing for heavy attack. Please say how you enjoy it and I will maybe do more maps. 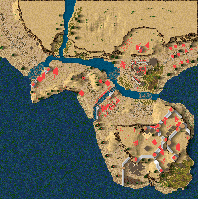 Suez should be another invasion and sinai desert would be cool skirmish map i think. Game version is actually 1.3. I do not know why I can not choose it. the reason could be you have steam installed,I had to uninstall steam after completing SH3 and Crusader 2,but for some reason Stronghold 2 is still listed as V.1.3 HD or you clicked on updates for the game.